No matter the industry, Gough Econ develops and designs state-of-the-art equipment systems for production efficiency in everything from salt handling to live ammunition. Our comprehensive bulk-material handling equipment from concept to solution improves and adds value to every step of your production process in turn increasing efficiency and profitability. We are dedicated to post-installation support for all of our customers. In need of spare or replacement parts? No problem. Send us your inquiry and we will work to expedite your spare parts requests. From raw to packaged product, our range of food process material handling equipment is custom designed to help your company succeed in today’s competitive marketplace. Our sanitary designs, with ease of access for cleaning, will help you achieve SQF and other food safety protocols. Gough Econ’s broad spectrum of product solutions, ranging from simple belt conveyors to vibratory products and complex bucket conveyors, ensure the safe handling of your product throughout every step of the production process. Gough Econ is committed to the highest level of service for all of our customers, big or small. When onsite support is needed, we take great pride in our ability to provide a rapid and efficient response. We also offer preventative maintenance programs that help you avoid unscheduled downtime and lost production. These programs also help you control maintenance costs over the life of your system. Our wide range of products offer the most innovative, dependable and efficient bulk material handling solutions. Inefficiencies, unscheduled downtime, and unexpected maintenance costs threaten your production, and the time spent attempting to fix these errors cost you more money. In most cases, these errors can be prevented in the design and pre-engineering phase of a bulk material handling equipment system. Gough Econ specializes in conceptual, pre-engineering designs across a multitude of industries, and offers a large variety of equipment to help alleviate your production pain-points. One of the many advantages to partnering with Gough Econ is the guarantee of working with an engineering and manufacturing company with over 43 years of experience and a global success track record. Not only will your need for bulk material handling equipment designed to save you time and money be fulfilled, but your systems will be integrated and designed for reliability and dependability. At the end of the day, the success of your manufacturing cycle is dependent upon the systems and solutions you have in place. You need a proven solution that delivers quality and precision in any environment. 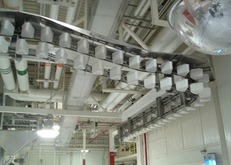 Gough Econ’s material handling conveyors are designed to help you achieve your production goals. Available in various sizes and configurations —from vibratory conveyors to slider bed belt conveyors to custom bucket conveyors— the bulk material handling solutions are endless. The key is choosing the right material handling equipment manufacturer with an end-to-end system that meets your needs and requirements. You need to work with an established vendor, like Gough Econ, that creates leading systems designed to add value to every step of your process. Before you implement an automated system, contact Gough Econ to help you evaluate the benefits of an integrated system, analyze your manufacturing objectives, and review the production features you desire. Process improvement can transform your business and save you time and money. We evaluate each step and seek ways to improve quality and production. We help establish metrics and determine what KPIs you need to achieve to move your products quickly and efficiently. We seek ways to shorten processing times and reduce manual handling, and maximize efficiencies by implementing state-of-the-art bulk material handling equipment. Evaluating the current use of space, we can determine ways to logically streamline your material handling equipment. The possibilities with our integrated systems are unlimited and perfect for reconfiguring existing space. After you absorb the initial costs for installation and setup, Gough Econ’s patented, custom designs are engineered with the end goal for your business to see increased profits. Just to name a few, here are the proven benefits you will experience from using Gough Econ’s innovative material handling equipment that is focused on production efficiency with attention to detail. 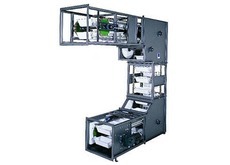 The ability to stack equipment, materials, and products opens up workspaces while creating additional storage space. Employees can achieve more in less time with streamlined efficiencies using material handling equipment. Automated systems can allow you to accomplish more with fewer employees. In turn, you can reduce your overhead and make more profit. By fulfilling orders faster and more efficiently with fewer errors, you can add more customers while increasing their satisfaction. When you eliminate heavy lifting, you prevent potential employee injuries and increase OSHA compliance. 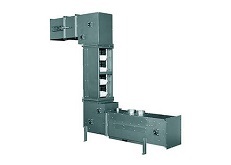 Bulk material handling equipment is designed to move, store and control materials. The features you need are heavily dependent upon the type of products you produce and what you need to achieve. Gough Econ’s experienced sales engineers can expertly guide you through the design process. We help you select features that maximize layouts, minimize downtime and achieve optimum throughput. We work closely with you to understand your processes and needs. Gough Econ is committed to delivering the highest level of service to every customer – no matter if your production is big or small. From bucket elevators to conveyors – each type of equipment comes with features designed to increase your efficiency. Let our expert engineers of integrated systems and bulk material handling equipment do the work. Contact us directly to learn more about how our innovative automation products and solutions are guaranteed to save you time and money. Gough Econ is a world leading engineer and manufacturer of comprehensive and integrated solutions to bulk material handling industries on a global level. Specializing in total integration of new or existing systems, Gough Econ focuses on total integration from concept to solution plus post-installation or delivery support for all clients. Whether partnering with a food-handling or metal and powder industry leader, Gough Econ is dedicated to the development and timely delivery of systems that move product safely and efficiently. With a reputation for innovative, high-quality service and equipment, Gough Econ is the company you can count on and partner with on large scale investments and complex projects for the best possible solution and outcome.